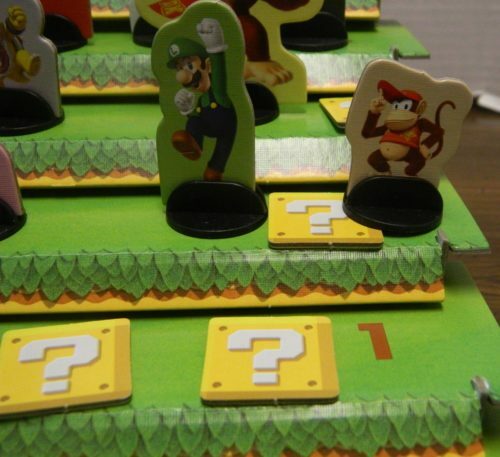 Being one of the pioneers of the video game industry, it is not surprising that Mario has occasionally popped up in the board game arena. Most of the Mario themed games are pretty generic roll and move games but there have been some interesting games released in the past. 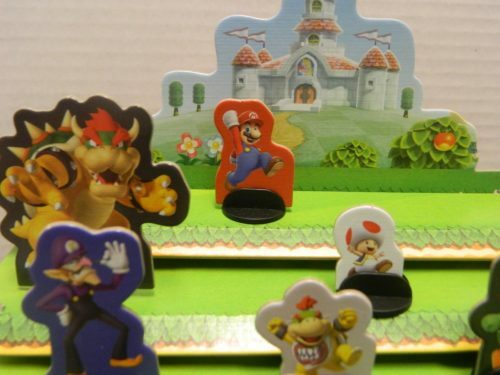 In the last couple years USAopoly (known for making themed versions of games like Monopoly) acquired the Mario Bros license (for board games) and used it to make quite a few games. Most of these games were just re-themed versions of classic games like Monopoly in order to make a quick buck. 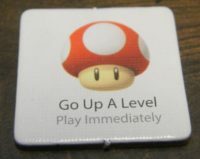 USAopoly occasionally releases some interesting games though including today’s game Super Mario Level Up!. While not a fantastic game, Super Mario Level Up! is considerably better than your typical licensed game as it has a decent amount of strategy while still being accessible to gamers and non-gamers alike. 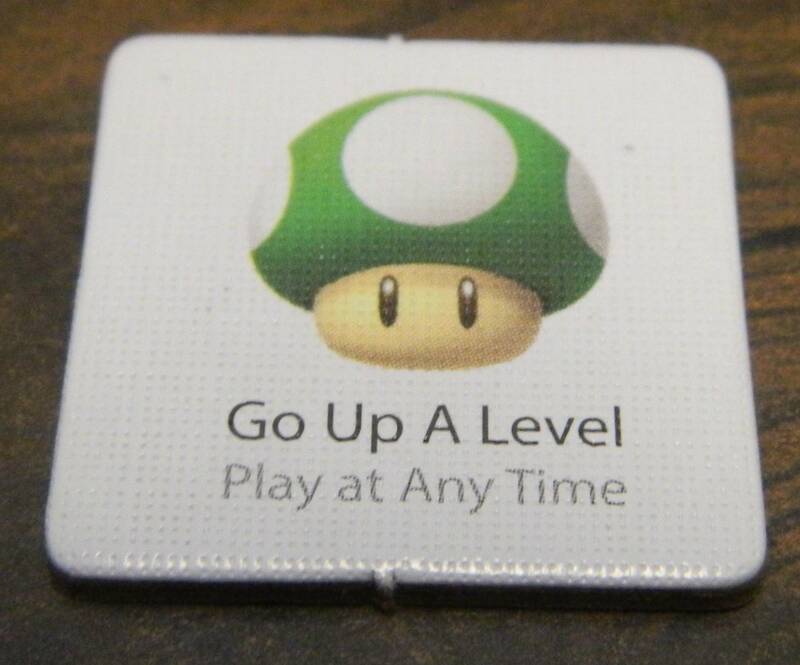 How to Play Super Mario Level Up! Insert all of the characters into a base and set them near the gameboard. Place all of the ? Blocks on the table face down and mix them up. 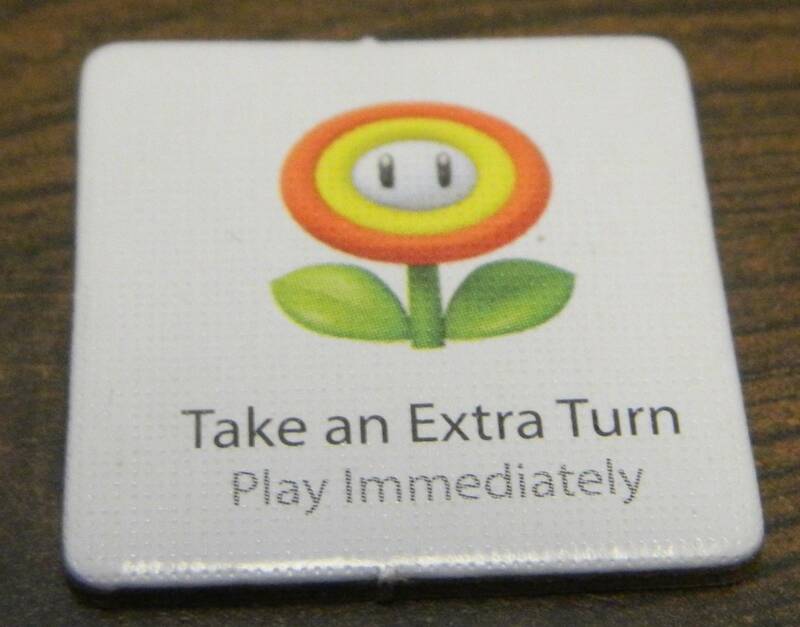 Shuffle the Power Up cards and place them in a pile face down near the gameboard. Super Mario Level Up! is played in three rounds. Before each round starts, the players will setup for the next round. Each player will take a Line Up card. 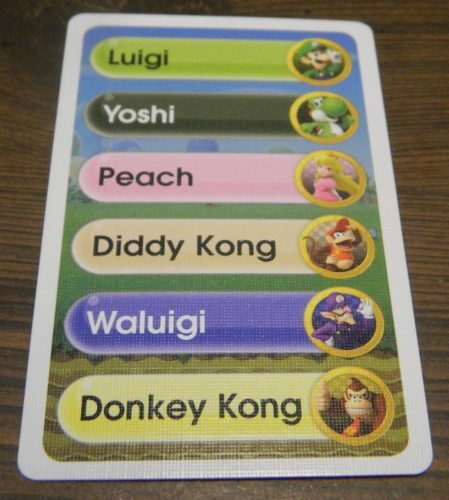 This Line Up card shows which characters the player will score points from during the round. Players should keep this card secret from the other players. 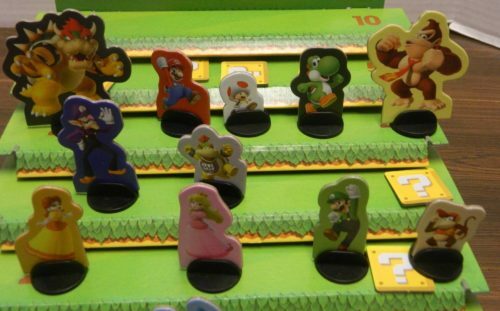 For this round this player will score points from Luigi, Yoshi, Peach, Diddy Kong, Waluigi, and Donkey Kong. The players will then take turns placing characters on the game board. In the first round the youngest player will place the first character. In the second and third round, the player to the left of the player who ended the previous round will place the first character. A player can choose any of the characters that haven’t already been placed on the board. They may place the character on any level between one and four. A character cannot be added to a level that already has four characters on it. After a player has placed a character, the player to their left places the next character. Players keep taking turns adding a character to the board until only one character hasn’t been placed (three characters in a five player game). The remaining character(s) are placed on level zero. Once all of the characters are placed, the ? blocks are added to the board. Four ? blocks are placed on level five. Any level between one and four that has less than four characters will get ? blocks until there are four characters/blocks on the level. No ? blocks are placed on levels zero and ten. The players have setup the board for the next round of the game. Starting with the first player, each player will take a turn moving one of the characters. When moving a character it must be moved up one level. A character can never be added to a level that already has four characters. A player tried to move Donkey Kong up to the next level. Since there are already four characters on the level, Donkey Kong can’t be moved to the level. When a player moves a character to a level that has a ? block, the player will take the ? block. If there are more than one ? block on that level, the player can choose which one they prefer. Diddy Kong was moved up a level. The player who moved him will take the block on the level he was moved to. Worth one point at the end of the game. Worth two points at the end of the game. Immediately move the same character up another level, if possible. When played move any character up one level. 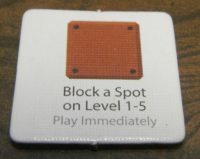 Place the block on one of the levels between one and five. This block will take up one of the four spots on that level for the rest of the round. Immediately draw a Power Up card. Immediately move the character you just moved down one level. When played move one of the characters down one level. To block a character from reaching level ten, you must play the block before the vote is called. The player who draws the block will lose their next turn. Move all of the characters from the level that the block was previously on down to the next available level. When moving characters you start with the character on the left side of the level. Whenever a player takes a ? 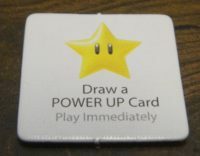 block, they will also take a Power Up card. Power Up cards are kept secret from the other players. The cards can be played at any time, depending on what the card says, for its effect. Once played, a Power Up card is added to the discard pile. Like ? Blocks, Power Up cards can be kept between rounds. This player collected a Power Up Card. 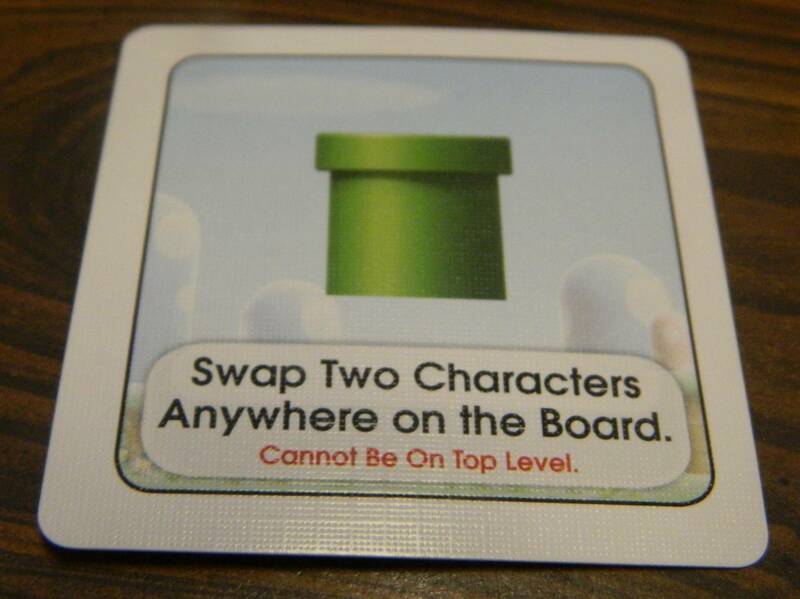 They can use this card at any time in order to swap two characters on the board. 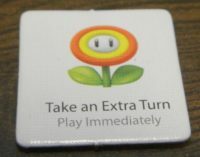 Once a player has moved a character and taken any other corresponding actions, play moves to the next player clockwise. 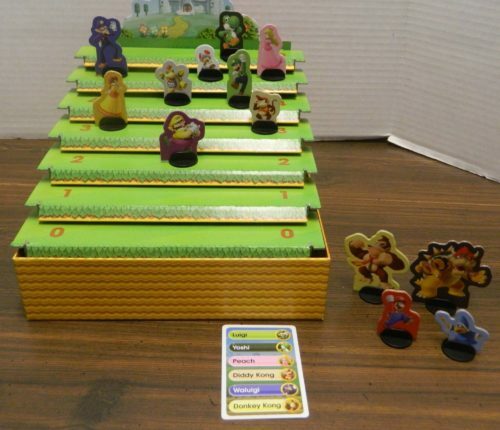 When a character reaches the tenth level, and no one plays a block or Power Up card to send them back; the players will hold a vote on whether they want the character on level ten to be the champion. Mario has reached the top level. All of the players will vote to determine if Mario will be the champion for this round. If all of the votes are yes, the character is declared the champion for the round. Scoring is then conducted. All of the players have voted yes so the character on the top level will be the champion for this round. If the character receives one or more no votes (without the votes being canceled out with a card), the character does not become the champion. The character is removed from the board and is only returned to the board if a card is played that returns them to the board. All of the players who played a yes card, add it back to their hand. Any no cards that were played are discarded until the next round. The round continues until another character reaches level ten. One of the players voted no. Therefore the character is removed from the game board. When a round ends, all of the players will reveal their Line Up cards. Each player will then score points based on the level for all of the characters on their card. 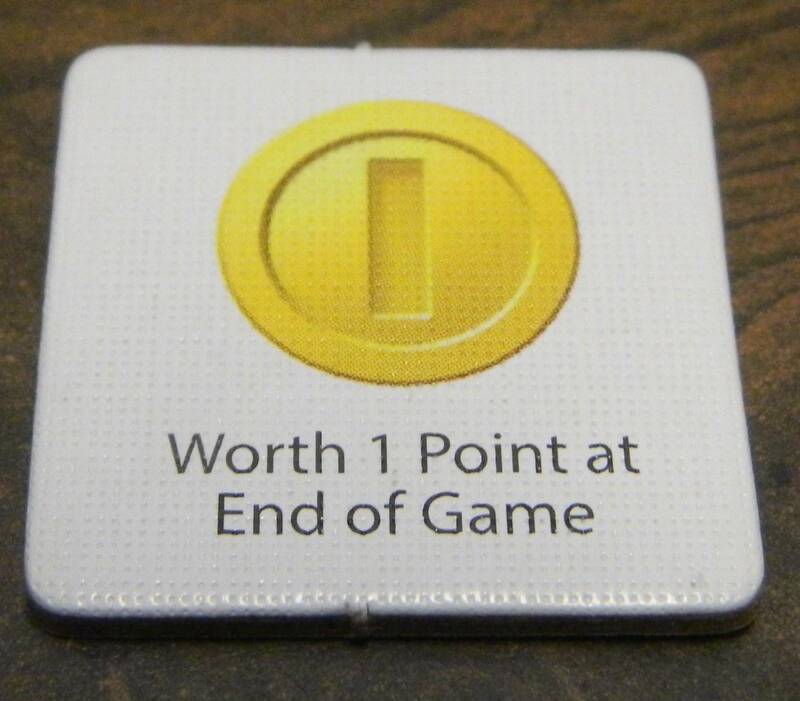 Any eliminated characters are worth zero points. Players record their scores on their score sheet. This player will score points as follows: Luigi-4, Yoshi-10, Peach-5, Diddy Kong-3, Waluigi-5, Donkey Kong-0. The player will score a total of 27 points. In the third round there are two unique scoring rules. Any ? 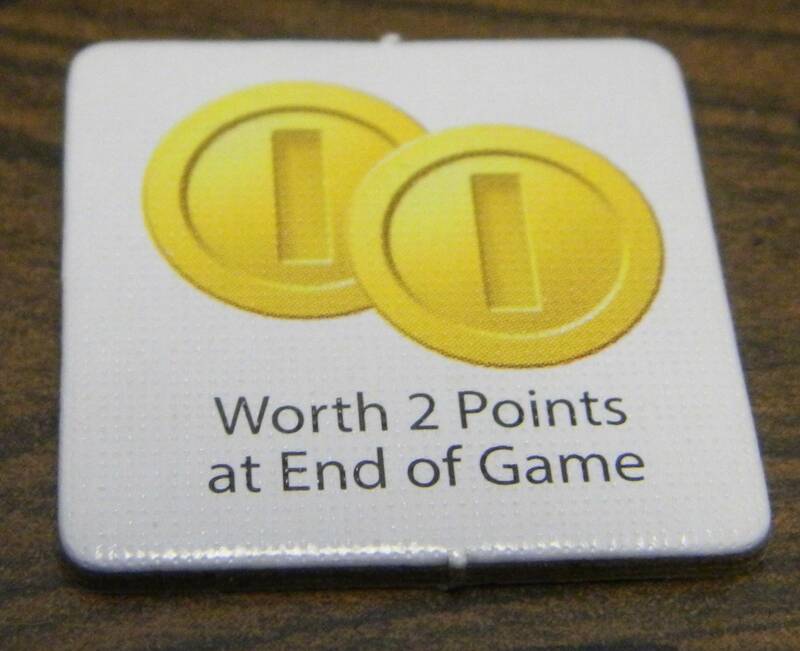 blocks that reward points are added to a players’ total score at the end of the round. If a player scores zero points in the third round, the player will instead score 33 points. If it wasn’t the third round, another round is played. All ? blocks still on the board from the previous round are removed from the board. All ? blocks not controlled by a player are turned face down and are mixed up. Each player will replenish the “no” vote cards in their hand to the number listed in the setup section. The game ends after the third round. All of the players add up how many points they scored in the three rounds. The player who scored the most points wins the game. If there is a tie, the players compare their Line Up cards to the characters still on the board. The tied player with the most characters still on the board, wins the game. If there is still a tie, the players share the victory. My Thoughts on Super Mario Level Up! 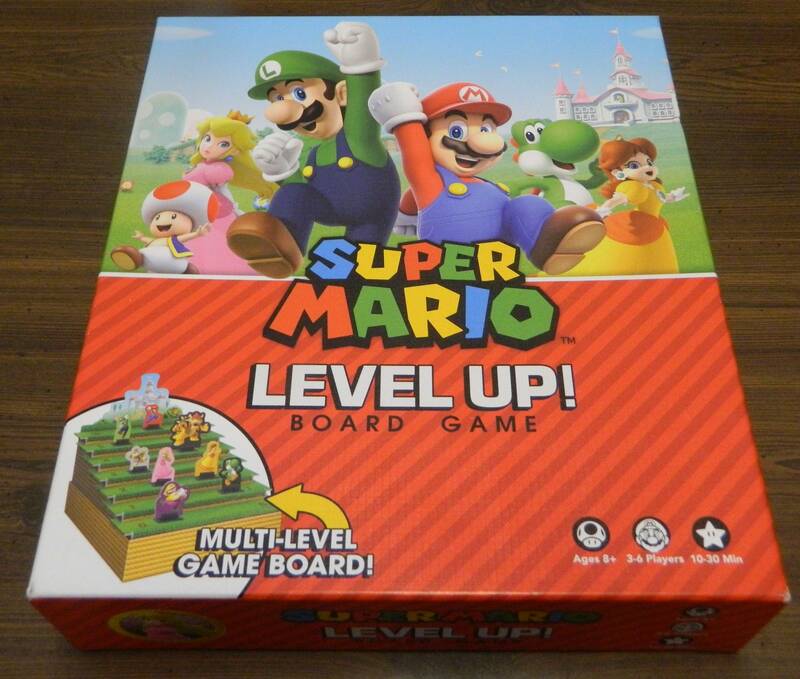 Before getting into the details I would like to begin by saying that while not a re-theme of a popular board game, Super Mario Level Up! is still a re-themed game. It just so happens that it is a re-theme of a lesser known game named King Me! which was released back in 2004. The games for the most part are identical as the only real difference I could find was the addition of ? 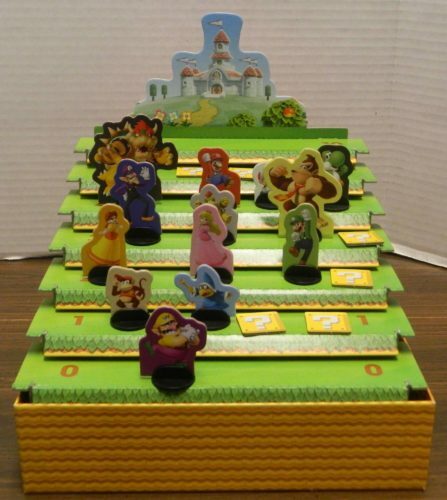 blocks and cards in Super Mario Level Up!. As the two games are basically the same, if you have ever played King Me! 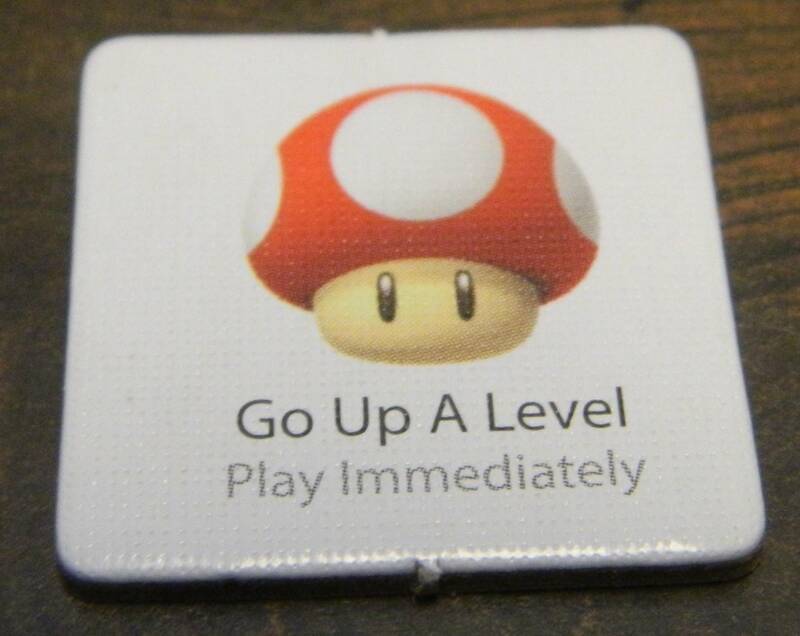 before you should have a good idea of whether you will like Super Mario Level Up!. As I mentioned in the opening, the thing that I was most worried about with regards to Super Mario Level Up! is that it felt like it was going to be another quick cash grab like most games made by USAopoly. While Super Mario Level Up! is not fantastic, it is a better game than I was expecting. Instead of just taking a popular game and slapping on the Mario theme, Super Mario Level Up! re-purposed a good board game that has been somewhat forgotten in recent years. You can argue whether the theme was mostly just pasted on (which I will discuss later), but you can’t deny that the designers actually put some work into Super Mario Level Up!. If I had to classify Super Mario Level Up! I would call it a combination of a bluffing and a deduction game. In the game players take turns moving one of the character pawns up one level on the game board. This seems straightforward but there is some strategy behind choosing which character you should move. 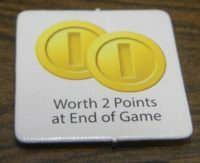 All things considered you would want to move the characters on your own card as it will score you more points. The problem is that the other players know this so they will watch which characters you are moving. Thus players need to switch off between moving their characters and other characters to hide their true intentions. This creates an interesting balance between bluffing and deduction. To do well in the game you need to create a good balance between moving your own characters and moving the other characters. If you move your characters too much, the other players will notice and they will vote against your characters if they reach the top. This will make them worth zero points. You don’t want to play too passively though as if you never move your own characters it is going to be hard to score more points than the other players. While worrying about which pieces you are going to move, you need to keep track of what the other players are doing as well. If you notice a player moving a particular piece a lot, you likely found one of the characters that they have on their card. The bluffing and deduction mechanics become really interesting when you get to voting. 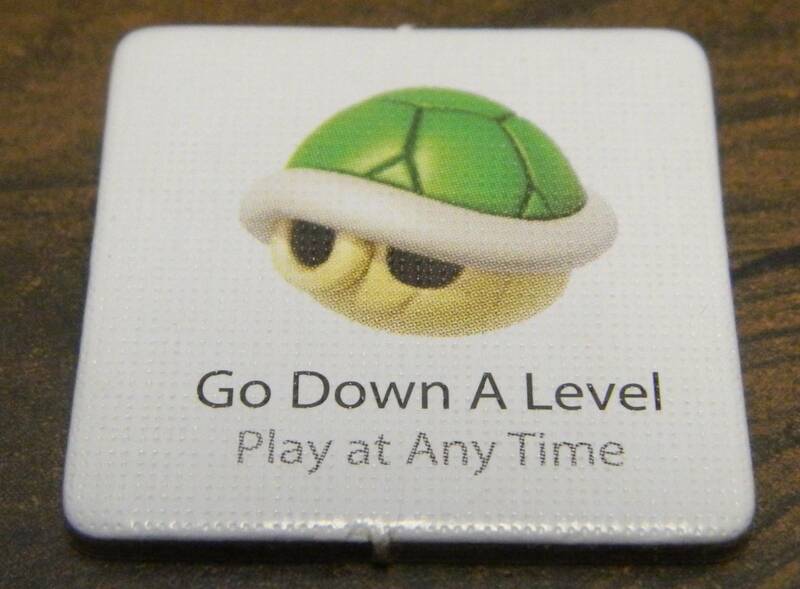 Unlike a lot of games, majority does not rule in Super Mario Level Up!. All that is needed to eliminate a character is one no vote. This creates some interesting dynamics for the game. If you have the character on your card you pretty much will always vote yes as it doesn’t matter if people know you have the character at this point in the game. If you don’t have the character though things become quite a bit more interesting. Only needing one no vote to eliminate a character adds a risk taking element to the game. At the beginning of each round, each player only receives a certain number of no cards. Once you play a no card, you lose it for the rest of the round. Therefore you don’t want to play one of your no cards if you can avoid it. If you don’t have a character on your lineup card, the best scenario for you would be to have another player play one of their no cards. This would still eliminate the character and you wouldn’t lose one of your no cards. What if none of the other players play a no card though and a character you don’t have becomes the champion? This introduces a really interesting risk/reward mechanic to the game as you try to figure out how the rest of the players will vote. Guess right and you could benefit a lot. Guess wrong and you could be in trouble. While these mechanics seem really simple, they work quite well. Super Mario Level Up! is far from a highly strategic game but there is enough strategy in the game to keep most people interested. Your decisions in the game, especially when it comes to voting, will have an impact on how well you do in the game. At the same time though the game is simple enough that the game should appeal to children and adults alike. There is enough strategy to the game to keep gamers interested while not being too intimidating for people that don’t play a lot of board games. I had fun with the game and I could see it working quite well as a family game. So far everything I have discussed applies to King Me! 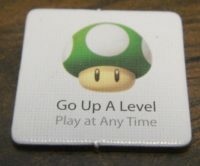 as well as Super Mario Level Up!. 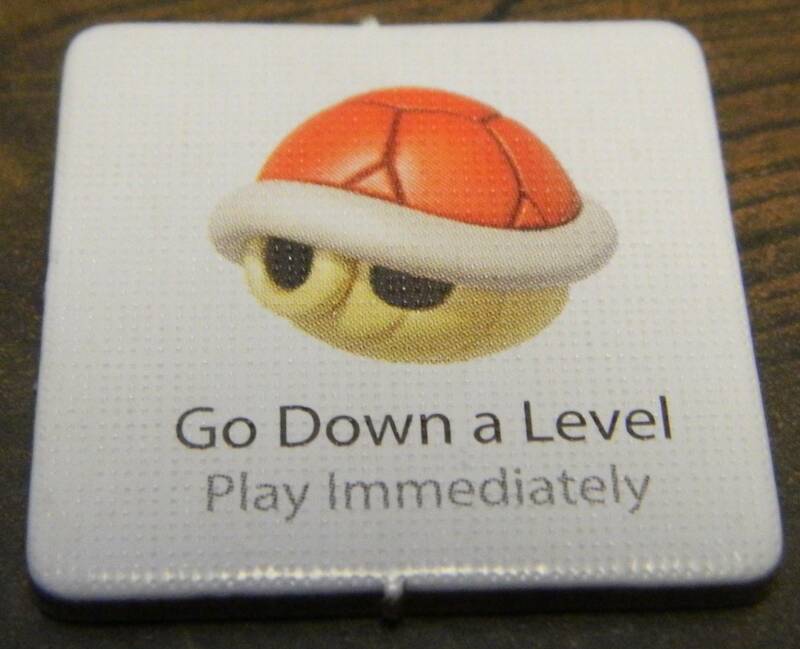 Lets move onto the one area where Super Mario Level Up! differs from King Me!. I have some mixed feelings about the ? blocks and the cards. They mostly just add luck to the game but in some situations they do add a little strategy. Basically when a player lands on a level with a ? block, they will flip it over which applies some special effect to the game. 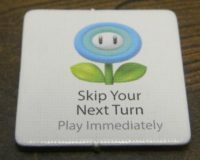 These add some variety to the game as they move characters up and down the game board, force people to lose turns, or take a few other actions. These blocks force players to always be on the watch as your strategy can be messed up by just one block. While I don’t think they go so far as ruin the game, I will say that the blocks and cards (which you draw after revealing a block) are kind of overpowered. There may be a few blocks that are negative but for the most part they benefit the player that are able to flip them over. 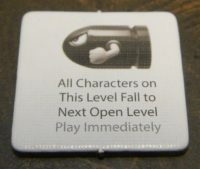 Therefore most players will begin each round moving characters onto levels just so they are able to take a block. The blocks themselves can help the players but the cards are usually even more powerful. By far the most powerful card in the game is the card that allows you to cancel a vote. As most votes will only get one or two no votes (at least in four player games), being able to nullify one no vote could be the difference between making one of your characters champion and them being eliminated from the round. Players that get the best blocks and cards will have a pretty big advantage in the game. Other than the blocks and cards, the only other area where Super Mario Level Up! differs from King Me! is the theme. While I was cautious due to the fact that most licensed games are terrible, I have to admit that the Mario theme was enough to encourage me to pick up the game. I am a pretty big fan of the Mario franchise so I wanted to add a Mario game to my board game collection. For the most part I would say that the Mario theme is neither great but it isn’t wasted either. You can tell that the theme is kind of pasted on as none of the gameplay really depends on the Mario theme. At the same time the theme is not distracting and will appeal to fans of the franchise. The designers did a good job applying the Mario theme the best they could to King Me!. It might not be as appealing to people that aren’t fans of the franchise though as they might not know who some of the characters are. While I liked Super Mario Level Up!, it is not a perfect game. I think the biggest problem with the game is the fact that you don’t have a lot of control over your fate in the game. Combined together the other players are always going to have more impact on the game than you will. You only have direct control over the game in two areas. First you have full control over which character you choose to move as long as the character you want to move isn’t blocked by four characters on the next level. The other area where you have some control is your vote. You can block a couple votes with your no cards but after that you no longer have an impact on the vote. This can work in your favor but can also work against you. Your success in the game is going to heavily depend on how many players have the same characters as you on their cards. If there are multiple players who have the same characters, those characters are likely going to be moved towards the upper levels. A player who doesn’t have that character could end up eliminating them with a no vote. That no vote could be nullified by a veto card though. Meanwhile a player who has a bunch of characters that no one else has is going to have a pretty hard time doing well in the game. They will basically have to move all of their characters on their own. When one of them reach the top level they will have to hope the other players goof and no one plays a no card to eliminate the character. Your decisions do have an impact on your fate in the game. Sometimes the luck of the draw could decide whether you have a realistic chance of scoring the most points in a round though. 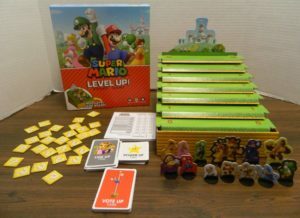 Like a lot of USAopoly games, I can’t say that I am a big fan of Super Mario Level Up!’s components. On the positive side I like the game’s 3D game board. 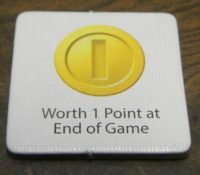 The game could have just included a basic flat game board and called it a day as it wouldn’t have impacted the gameplay. The 3D gameboard is a nice little addition to the game though. I also applaud the game’s art style as it utilizes the game’s theme as much as possible. The problem with the components is that they just feel cheap. Basically all of the components are made of cardboard. The gameboard is kind of flimsy. Instead of including plastic figures of the characters, the game decides to just use cardboard. The components serve their purpose but they could have been quite a bit better. Should You Buy Super Mario Level Up!? When you first look at Super Mario Level Up! it looks like another really cheap licensed game made solely to cash in on people’s love of Mario. While it is basically a re-themed version of King Me!, Super Mario Level Up! is different from most licensed games. It is actually a pretty good game. Basically it is a combination of a deduction and bluffing game with some voting mechanics added in as well. Basically the goal is to move your characters up the game board without the other players becoming suspicious. When a character reaches the top you have to figure out whether you want to vote yes or no. While Super Mario Level Up! is never going to be considered a highly strategic game, there is more strategy to the game than you would expect. With the game’s simplicity, it will work quite well as a family game as both children and adults can have fun with the game. The main problem with the game is that it still relies on quite a bit of luck. Some of the blocks and cards are overpowered and you are going to have a hard time winning the game if none of the other players have your characters. The component quality could also have been quite bit better. If you don’t really like bluffing, deduction, or voting games, or could care less about the Mario franchise; I don’t think Super Mario Level Up! is the game for you. If you already own King Me!, the only reason to pick up Super Mario Level Up! is if you really like the theme. If you are a fan of the Mario franchise or you like the premise behind the game, you should enjoy Super Mario Level Up!. For a good price, I would recommend picking up Super Mario Level Up!. There is a surprising amount of strategy in figuring out when to use your "no" vote cards. For a licensed game there is enough to the game that the whole family can have fun. If you get stuck with characters no other players have, you are going to have a hard time winning the game. The component quality could have been quite a bit better.